My 2 year old daughter lost her favorite doll, which she named Patty! It’s her absolute soul mate, and she cannot sleep without it! She lost it on Saturday, the 13th of June, in Cheltenham Town Centre between 3 and 5pm. Our family is devastated! The lost doll is called ‘Meg’ and is predominantly yellow/cream in color. She is a RUSS doll wearing a bakers hat, which is cream with a yellow band. 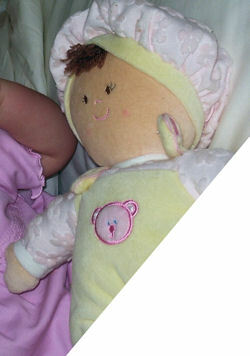 She has a pink bear embroidered on the body and a brown tuft of hair from the hat. She has a rattle inside and is made of velour. She is also known as angel doll, but she is a discontinued line made in about 2003/4. She was bought in September 2006. I researched all over the internet but could not find the exact one, although I am purchasing Russ Berrie Little Prince, as it is a close match in terms of material and size. I have found your doll! I was looking for one similar and have managed to order one. I'm not sure where you are in the world. The store is babies r us online canada. is the link you'll need. You need a canadian address to post it to (they only deliver within canada). i live in australia so ordered it to be delivered to a friend there who then posted it onto me here. ebay #230657790662 buy now make offer ending soon might re list or talk to seller.